DR.MANFRED GERSTENFELD INTERVIEWS DOCUMENTARY FILM MAKER WILLY LINDWER……. – The Tundra Tabloids……. DR.MANFRED GERSTENFELD INTERVIEWS DOCUMENTARY FILM MAKER WILLY LINDWER……. This interview was published at INN and republished here with the author’s consent. Documentaries made by people such as Willy Lindwer, who are actually interested in delivering to the viewer, the factual, historical record of the subject they’re pursuing, are worth their weight in gold. Documentary filmmaker Willy Lindwer was born in 1946 in Amsterdam. He lives today in Jerusalem. For his widely shown movie “The Last Seven Months of Anne Frank,” he received the international Emmy Award in 1988 –the world’s highest honor for a TV-filmmaker. In 2010, Lindwer was knighted by the Dutch queen. 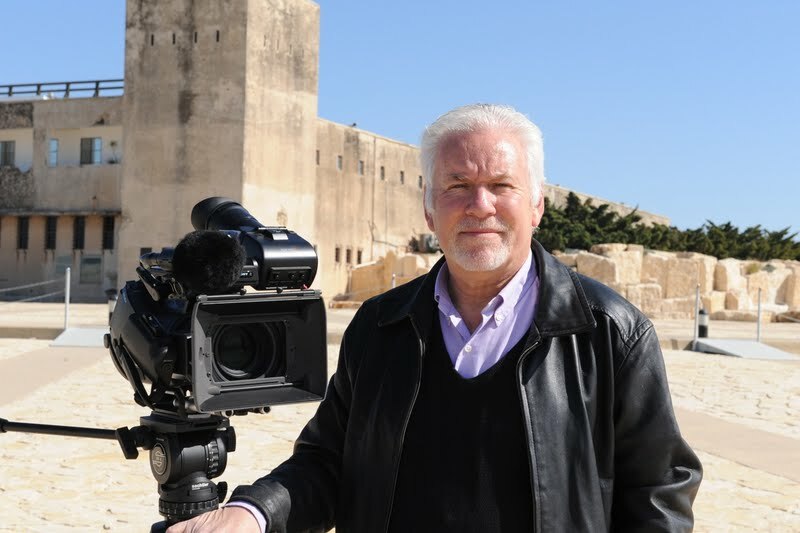 “When I studied at the Dutch Film Academy in Amsterdam in 1969, I made a two-part documentary about the role of the Dutch police during the German occupation. It was rather shocking because in the 1960’s, most chief police officers themselves had a dubious war past. The Dutch authorities had kept them in the police force without much investigation. “At the time, Dutch TV stations did not want to show my movie. The director of the film academy told me that the media still considered the wartime role of the Dutch police taboo. Only in the 1980’s did sudden interest in this documentary emerge. “In 1986, I left Dutch public TV and became an independent producer. I was now able to produce movies about issues that touched me personally. The first was a biography of Marek Edelman, the only leader of the Jewish resistance in the Warsaw Ghetto who was then still alive. He became a well-known cardiologist in Lodz. “Luckily I was sitting on a chair, otherwise I would have fainted. I answered, ‘I will make this documentary without your participation.’ In my movie, the Anne Frank House is not shown or mentioned. Later, in other contexts, a great conflict arose as the fact that Anne Frank was Jewish did not seem to fit the foundation’s agenda. They preferred to focus on discrimination in general and not specifically against Jews. Due to the Foundation’s attempts at de-Judaization, they fired several pro-Jewish employees. “I have made 22 movies about the Holocaust, mostly involving the Netherlands. One was about the Dutch transition camp Westerbork. From there, the trains with Jews departed to the extermination and concentration camps in Poland. Yet another movie dealt with the way the Jewish Council in Amsterdam functioned and the impossible decisions it had to make. “In 2000, I made a two-part movie titled ‘They Did Their Duty.’ It was a series of conversations with Dutchmen who played a role in the deportation process. Included in the movie were people who stamped a “J” in Dutch Jewish identity cards, policemen who arrested Jews, guardians in Westerbork and railway personnel who transported Jews. “The culmination of my work on the Netherlands was the two-part movie ‘Goodbye Holland,’ (2004). It portrayed the varying attitudes of Dutchmen during WW II. The movie also recounts the story of my own family members. Some were betrayed by Dutchmen, arrested by Dutchmen, were guarded in Westerbork by Dutchmen and sent on the initial route to their deaths in Poland in trains with Dutch conductors. No Germans appear in this movie. “I also made several movies about the war outside the Netherlands. One is a documentary from 1992 about the Wannsee Conference, fifty years later. On the 20th January 1942, key German personalities discussed how to carry out the destruction of the Jews. Another movie in 1994 is a biography of Simon Wiesenthal, the Austrian Jewish Nazi hunter. Lindwer also made documentaries not related to the war. These include movies about former Jerusalem Mayor Teddy Kollek (1993), former Prime Minister Yitzchak Rabin (1998) and the current President of Israel, Shimon Peres. Previous Post Previous Post MELANIE PHILLIPS: IT’S COME TO THIS, A 7 YEAR OLD BOY DEEMED A RACIST……? Next Post Next Post BARRY RUBIN: THE INFIGHTING OF PALESTINIAN FACTIONS WITHIN THE P.A. BODY POLITIC: WHAT TO EXPECT……. Searching online for these videos reveals a curious absence of availability either through viewing online or for-purchase through Amazon etc. Surprisingly, even Lindwer’s site hasn’t been updated since 2005. Sad, really. Is this a form of self-censorship? Given current affairs, if NOW isn’t the time for exposing this video documentation – – -pray tell, when?